I love to have a subtle shimmer on my tanned skin in summer. Personally speaking, I think that it makes you look so much more radiant. Therefore I would like to introduce you to two newly launched products that are beautifully scented while leaving your skin with the perfect golden glow. Roger Gallet takes you on an olfactive journey into the Andalucian gardens of the Alhambra in Grenada under the orange trees of the Generalife Palace. Capture the vibrant sunshine, as well as the freshness of the leaf and the fruit, the softness of the flower and the fresh sensuality of orange wood. Inspired by the luxurious gardens of the Alhambra, Eau Sublime Or takes you on an exotic olfactory journey. Once sprayed – citrus fruits from Italy refresh and delight, revealing themselves a few minutes after spraying, floral & feminine heart notes of ylang, orange blossom and coconut flower are sublimely sensual. The final touch of glamour & chic – delicate flecks of gold settle on your skin in a subtle shimmer, beautifying the skin with radiance. An indulgent beauty ritual of summer glamour, illuminate your skin with Crème Sublime Or. Enriched with a cocktail of 6 nourishing oils (Macadamia, Argan, Camelia, Primrose, Sesame and gentle Almond), this luxurious body cream with a delicious and enchanting fragrance, moisturises and softens your skin for lasting hydration. Its delicate flecks of gold give a subtle illuminating effect. Rich but non-greasy, quickly absorbed by the skin. No parabens. Dermatologically tested. 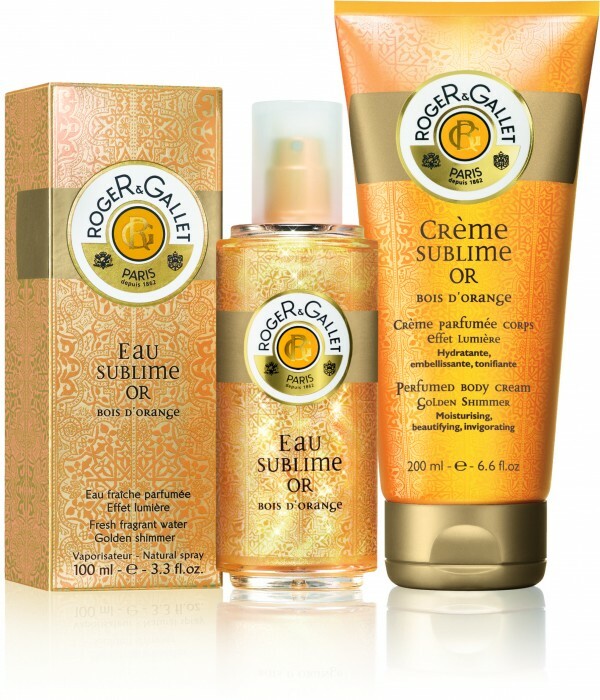 For store locations, please visit the Roger Gallet’s homepage.